This is the second posting to go up in a short time. The management of my website has moved to John Price. I want to say a big thank you to Shela McCullough and Linda Mtambo of HEARD for all that they did to keep my posts flowing! By early next year we will have looked at the design of the site and changed it. I hope to make it somewhat interactive. I was in the UK and South Africa in late September and early October. The first part of the trip was covered in my last posting. This one is about Durban, Cape Town and Norwich. After 24 hours in Durban (a silly side trip because I was not paying attention to my travel plans), I flew to Cape Town for a Health Systems Symposium. These meetings are held every two years, this was the third, the first I had been to. As all my South African family lives in Cape Town and the environs I was able to see them. My visits to the South Africa will become less frequent in the years ahead, so this is important to me. I stayed on to visit Tim Quinlan, who worked with me for many years. We also used to play touch rugby together in the 1980s and 1990s. 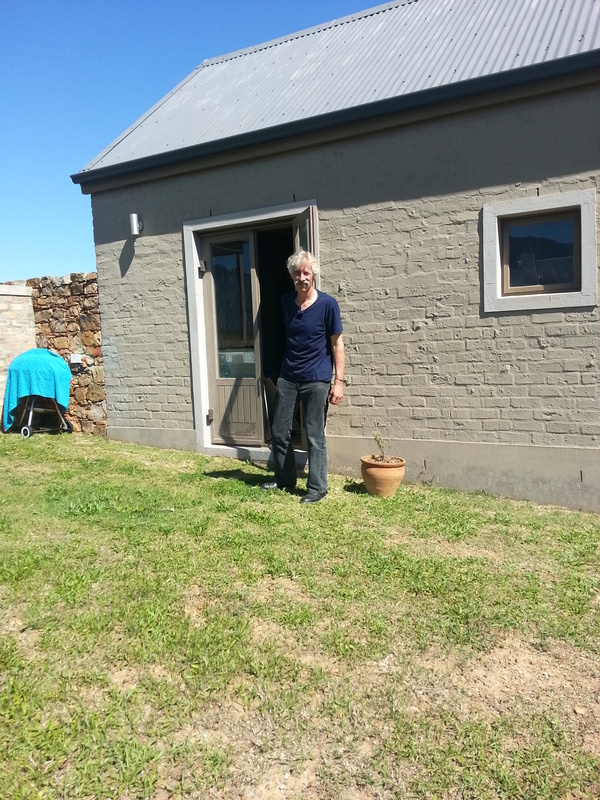 Tim is renting a snug, two roomed, former studio some 10 kilometers out of the small village of Greyton. The view from his house is absolutely spectacular, with the Overburg mountains in one direction and rolling wheat fields and vineyards in the other. There are some photographs posted with this blog. Greyton is only about two hours’ from Cape Town. The spring flowers, green beautiful hills and really good roads make it a real pleasure to drive. After getting to Tim’s abode, we went into the village to eat and watch a rugby test match between the Springboks and the All Blacks (New Zealand). It was a very close game. The Bokke won, but only in the last few minutes, by 27 to 25. The pub erupted when the final whistle went. Among the cliental, to whom Tim introduced me, was someone who recently had a leg amputated due to a blood clot, and a professional who had severe head injuries in a motorcycle accident many years ago. All in all the trip was a reminder of how lucky I am to be healthy, and have the opportunity to travel. The entire region had a planned power outage on the Sunday. I post a photograph of the special menu the local café was using on the day. 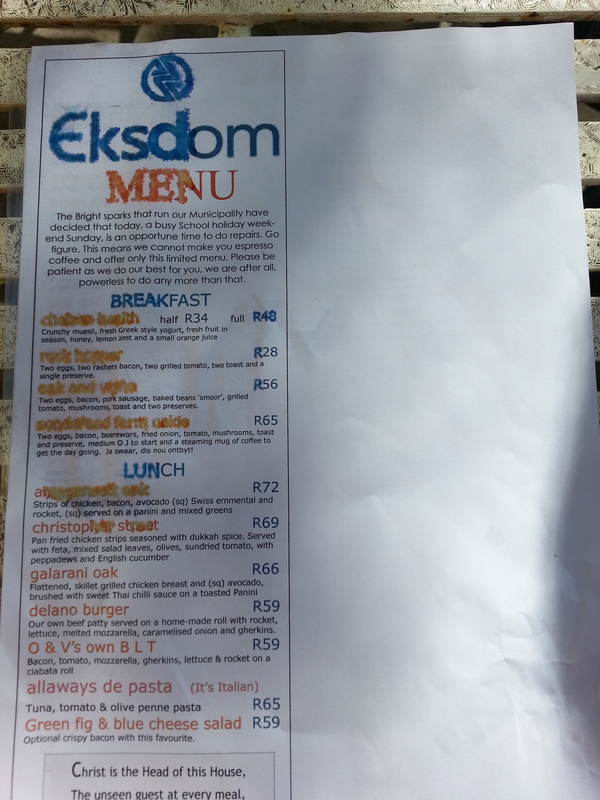 They amusingly, played with words and called it their ‘Eksdom’ menu, the company is ESKOM. This translates as ‘I am dumb’. Unfortunately they only printed one copy and it got wet early in the day! We visited Tim’s ex-wife’s candle shop in the village. This website is well worth a look. Her designs are quite stunning. I suggested to the Rastafarian working there that the power cut was the perfect time for some innovative marketing: a billboard saying: “Greta’s candle special- brought to you in association with Eskom”. However my attempt at making the most of the situation was not greeted with much enthusiasm. At the bottom of Tim’s hill is a large dairy farm. When I drove back to Cape Town, late in the afternoon, the cows were being brought in for milking. They were beautiful animals, a long line of Jersey or Guernsey cattle I think. It would have made a spectacular photograph with the evening light, dust and green grass. It was also a reminder that milk does not come in bottles or cartons. There was only one cattle herdsman right at the back of the 300 meter line. The cows knew where they were going and why. In a field, on its own, was a cow in labour. As I drove past I caught a glimpse of the calf emerging. This part of the country has probably been farmed for about 300 years and indeed the next village Genadendal is where first mission station in southern Africa was established by Georg Schmidt, a German missionary of the Moravian Church, in 1738. The Riviersonderend flows through the valley. This river’s name literally translates as ‘River without end’. It is a very South African river, not deep at all, more a series of pools, although it can flood. I flew on a particularly unique South African carrier: Mango Airlines. When I checked in I asked if I could use the South African Airways lounge as they are a partner. The agent said I could. At the lounge the receptionist told me that, because my ticket was booked with Mango and not SAA, I could not. I must have looked suitably devasted. She then asked, “Do you have an Investec Card”. I did, it is the card that identifies me as a ‘pensioner’! I coyly brought it out. It was not the Investec card she meant, she was looking for a high powered credit card. She allowed me to go ahead and use the lounge anyway. Did she feel sorry for me I wonder? I am not complaining because it meant I was able to sit and write. The meeting was fascinating and I found it deeply interesting to be with the health sector as opposed to the AIDS community. There is, of course, a lot of overlap. The Ebola epidemic got a fair amount of coverage, but there was no sense of panic. I attended a special session, organised on the fly. It seems the spread will continue, especially in African states with failing or failed health systems, with occasional cases in the developed world. The solution is better health systems. The one question I have not seen addressed is the economic consequences of the disease, not just in terms of direct costs but also the general shut down of economic activity epitomized by some airlines no longer flying to affected states. I traveled back to Norwich on 8 October. I was luckily able to get an upgrade with my air miles, on the KLM flight from Johannesburg to Amsterdam. For past nine months I have been almost exclusively in economy and it is hard going. I can manage the transatlantic flights: to Canada is a daylight flight and it means an awful lot of work can be done; coming back is short and a chance to catch up with films. 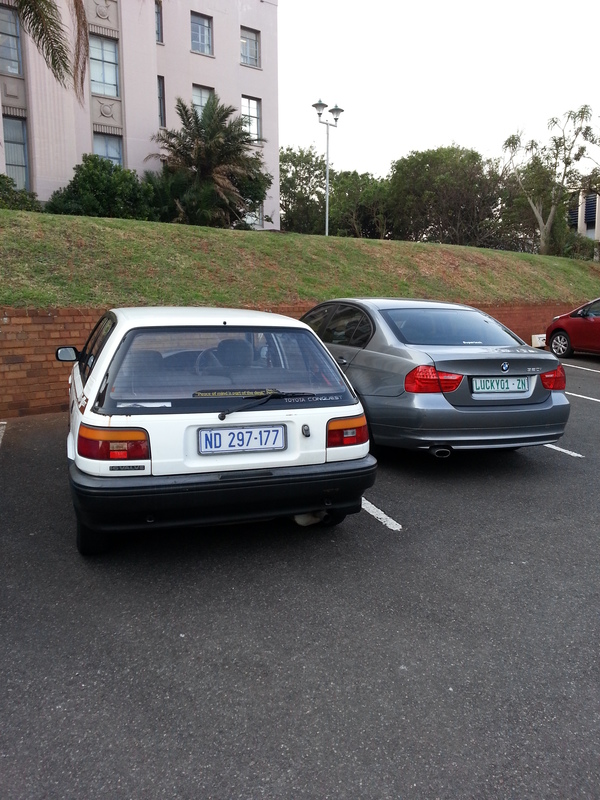 On my last day in Durban I sold my trusty car. It is a Toyota Conquest that we bought in 1992, with only 145 000 km on the clock. I felt very sad to see it go: my heart said keep it; my head said sell it. I do feel somewhat liberated not worrying about starting it and I will save on insurance and other costs. On future trips to Durban I will simply hire a vehicle. There is a picture of the car on the website. In Norwich there were many festivities on the 11th October. In particular there was an open church and little community sale at St Augustine’s’ church. 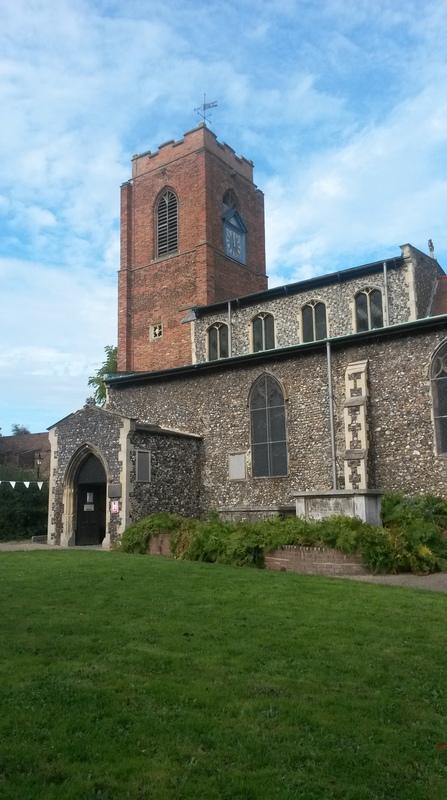 This is a unique building, mostly built from flint as so many of the 57 ancient churches in the Norwich city wall are. The tower is brick. There are some photographs on the website. The reason for the brick towers is the original one collapsed in 1677 and there were no longer, apparently, the skills to rebuild with flint. The replacement had to be brick, but it does look odd, and as a result the parishioners were known as the ‘Red Steeplers’. It was fun to wander round and look in the church. The person on duty Stuart McLaren had written a book, the biographies of more than 100 men from the parish who died in the First World War: ‘They are not Dead’. 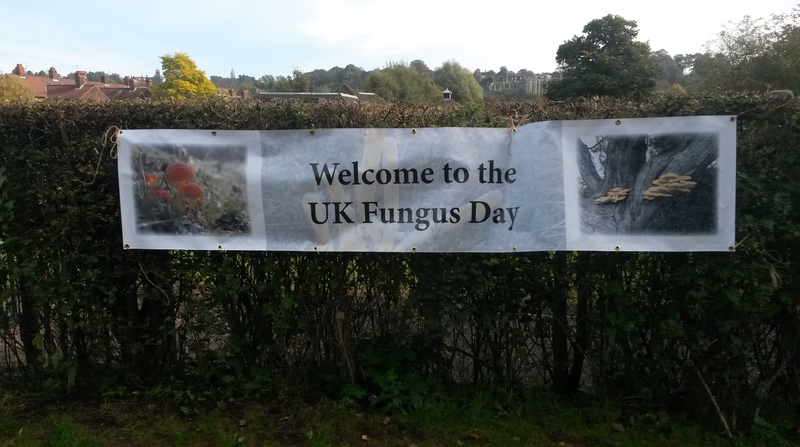 On Sunday we went to the UK Fungus day in the cathedral close. This is specifically about mushrooms, how important they are and how to gather them. Fortunately it was a beautiful sunny day. It was interesting to learn how mushrooms are growing commercially, peat from Ireland is a crucial ingredient. It is concerning that this is yet another non-renewable resource that is being rapidly consumed. So in the UK the lawn is mowed, the first of the leaves raked up and all is good. In a week I will be in Canada for the start of an extensive period. This has to include preparing teaching for 2015, which is going to be fun, and a great deal of writing. This entry was posted in Blog, Gallery and tagged Cape Town, Durban, Mbabane, Ngwenya Glass, Norwich, South Africa, UK. Bookmark the permalink.